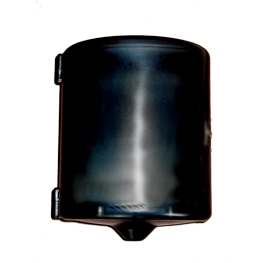 Translucent smoke black, break-resistant plastic dispenses 8" diameter roll in a variety of perforated paper grades with Whisper-quiet dispensing. Side entry allows for one hand loading. Dispenser has a Double-latch metal lock with key and comes with a Mounting plate detaches for easy Installation. Size is 9" x 9" x 11" .